Happy Saturday everyone!! I'm on vacation and it's awesome. It's only a 3-day weekend vacation, but it sure puts a smile on my face having an extra day to play. Whee! We are having friends over this afternoon for a BBQ and the weather is wonderful right now. My kids are already bugging me about filling up water balloons!! Speaking of balloons, I made these cards for a challenge over at Croppin' Paradise to make 2 similar cards using different sentiments. I used the Man of the House papers by Bella Blvd and the Button Bit stamp set from Papertrey Ink. The sentiments are also from the same stamp set. I cut the ballons with my Indie Art Cricut cartridge and added some stickles. Just to bling it up a bit!! I think the sentiments are perfect for sending a card to someone you haven't seen in a while. I can think of a few people who will be getting these cards!! I hope you are enjoying your Memorial Day weekend. Any big plans??? As long as the weather is nice for us, we will be spending it outside, BBQing, testing out my new cocktail recipe book and hopefully hitting the beach! Have a GREAT weekend everyone! 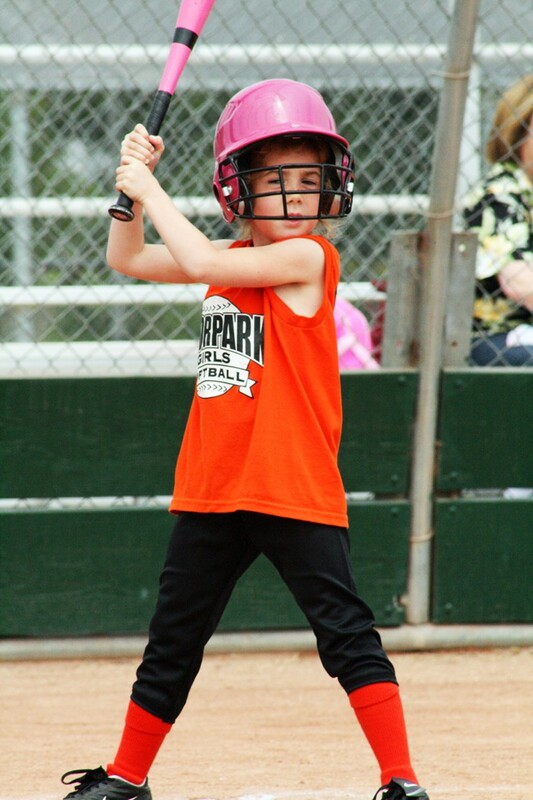 My daughter really enjoyed softball this year. She improved SO much and really was learning the game and was paying attention on the field (well...MOST of the time!). 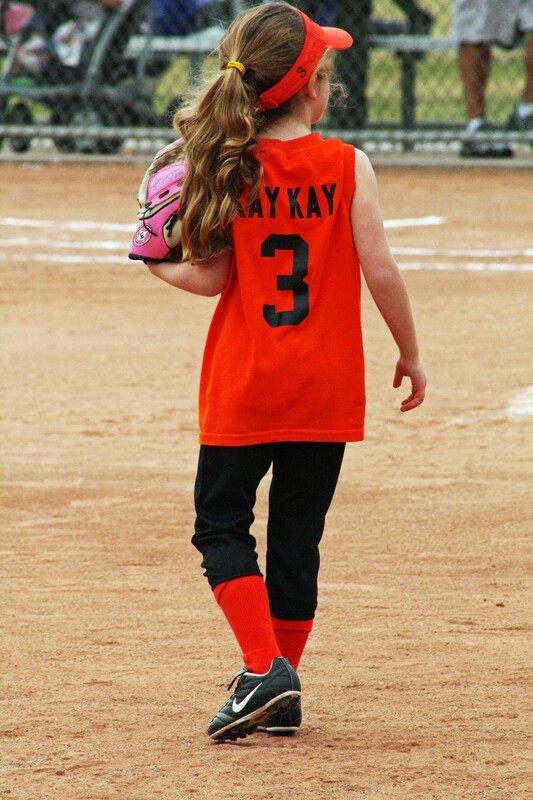 It was such a joy to watch her play this year!! They were the Orange Tigers this year. Don't you love the bright orange uniforms? Bright enough to stop traffic!! We had our pizza party last week and I really enjoyed making the treats for the girls on the team. First up...softball cupcakes! 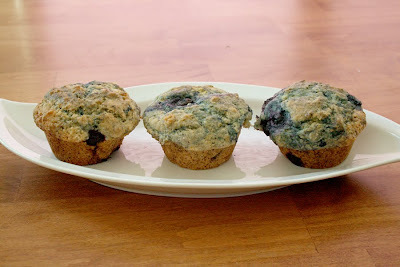 Super easy and they were a hit!! Next...uniform cookies. My MIL got me this t-shirt cookie cutter and I put it to good use making customized uniform cookies for all the girls. Please excuse the old crusty cookie sheet!! It's been around forever. I put each girls name and number on their own cookie. I loved doing this!! Coaches like cookies too, right???? Happy Wednesday everyone!! Halfway to the weekend...and a 3-day weekend for me. Yiipppeee!! I just hope the weather improves, it is supposed to rain today. I have one more My Mind's Eye project to show you. And it involves my new favorite Cricut cartridge...Wild Card. It has this one awesome cut that makes a doiley card. And it's so cool!! I just love this scalloped doiley circle card!! I used the So Sophie Graceful papers for this. I cut this flower on my Cricut and layered it up, added a button and some bling. The coolest thing about this cartridge is it cuts a matching envelope too. Did I say this was sooo cool??? The card fits perfectly. It will probably need extra postage, but well worth it! Now I just need about 8 more uninterrupted hours to explore all the other card cuts on that cartridge. There are sooo many COOL ones. LOL!! Thanks for stopping by! Are you looking forward to a 3-day weekend, too??? Happy Monday everyone! Today I am going to show you some delicious new papers from My Mind's Eye. These are from the So Sophie collection and they are beautiful!! I had the pleasure of working with the Graceful line from Croppin' Paradise. I loved the purples in this line. I thought it went so well with the purple in my daughter's shirt. This was her birthday Disneyland trip and she used her own money and gift cards to buy her very first, very own pair of ears! Almost everything is from My Mind's Eye, except these great letters from Cosmo Cricket. I like the black against that beautiful purple! I cut the flowers on my Cricut and cut the leaves by hand. I just crumpled them up a bit to give them some more texture. And I like the journaling spots from MME!! If you haven't checked out Croppin' Paradise lately, you should! They are getting brand new product every day. My Mind's Eye, Jenni Bowlin, Fancy Pants and Bo Bunny just to name a few. And we have some really fun plans for scrapping this summer. So join us over in Paradise!! Hi Everyone!! Welcome to Sweet Melissa Sunday. 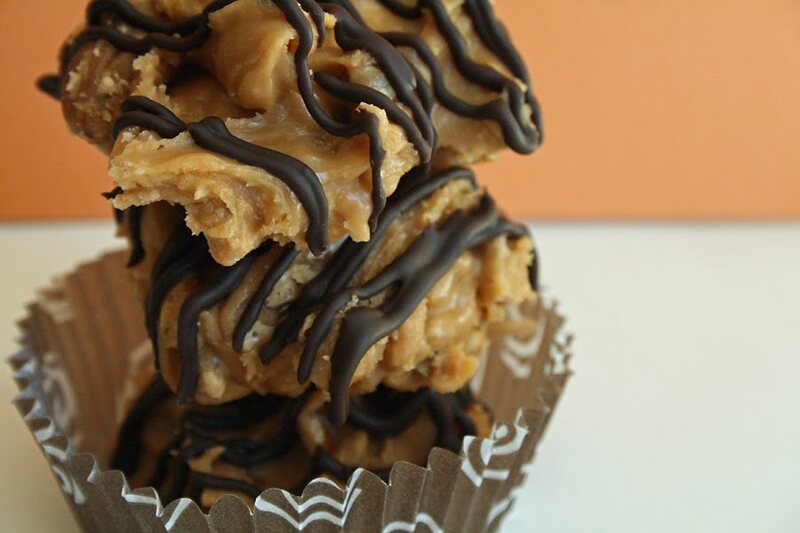 This week was Butterscotch Pralines. I've never made pralines before. In fact, any recipe that involves exact temperatures and a candy thermometer I usually avoid at all cost. But I decided to try this one. You can find the recipe on Tessa's blog, The Cooking Chemist. The recipe actually turned out to be pretty simple...sugar, more sugar, butterscotch chips, and pralines. And the candy thermometer wasn't so scary after all!! Okay...so I added some chocolate on top!! I don't even know if this is how they are supposed to look. 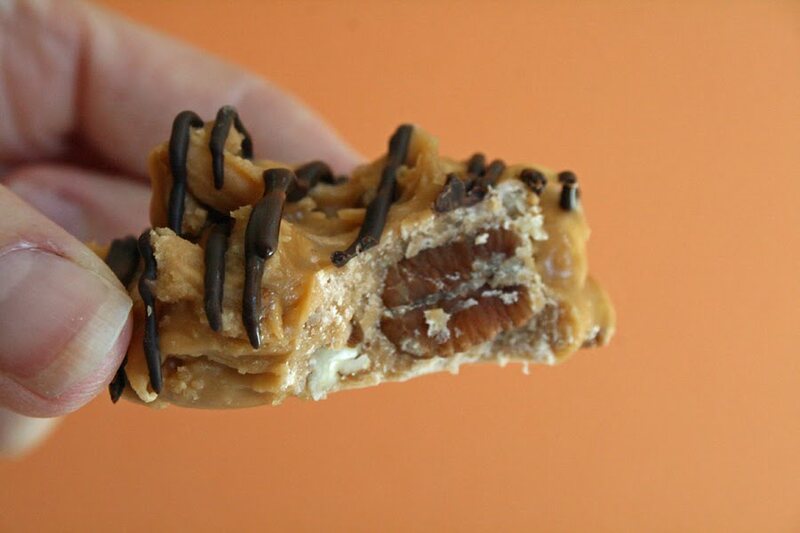 I had pecan pralines once, a long time ago when I was in New Orleans. And I can't remember what they looked like. LOL!! They kinda looked like blobs on my cookie sheet. So I drizzled some melted semi-sweet chocolate chips on top. These were very good. And very sweet. The kind of sweet that makes my teeth hurt!! Now I am anxious to see everybody's pralines to see what they are supposed to look like. This will definitely be a candy I seek out the next time I am out and about and near a candy store to compare. My kids liked them, but said they weren't their favorite. I think they would make very elegant gifts around the holidays, all wrapped up in a fancy box. And I loved the bites with bit ol' pecans! 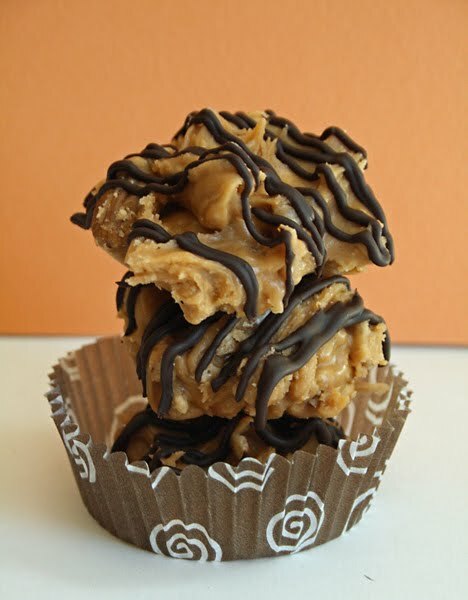 Don't forget to check out all the SMS Bakers to see how their pralines looked this week! Thanks for stopping by. Have a Sweet Sunday!! That is the million dollar question. Is it a cookie OR a brownie??? Bakerella calls them Congo Bars..or BROOKIES!! 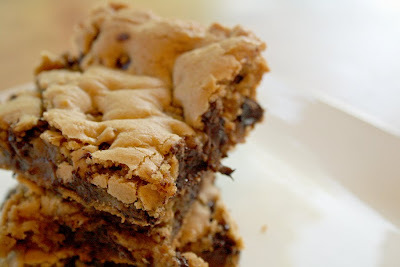 These are a fabulous combination of a cookie in a brownie format. And boy are they delicious! 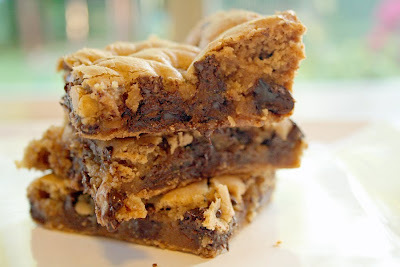 I think I might have not baked them quite long enough, but they were so good and moist and soft and gooey and chocolately. Oh my word, they lasted about 38 minutes in this house. 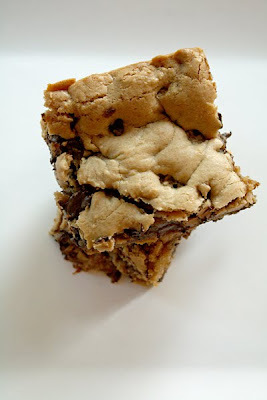 The recipe can be found on Bakerella's blog and I bet you have all the ingredients already in your pantry. What a fun Friday treat this would be!! I hope you had a fabulous week. Mine was so busy and i'm looking forward to the weekend. Hope you all have a GREAT one!! Making your own embellishments is IN right now. And the girls over at 3 Scrappy Boys dedicated their May newsletter to showing some really fun handmade embellies. What? You don't get the 3 Scrappy Boys newsletter?? Well go sign up HERE!!! --Spray your hearts with the spritz. Let the paper dry completely. --Cut out a small circle. Using this circle as a base, start arranging the hearts around the circle. Overlap the hearts a bit. --After all hearts are attached, add a button in the middle of your flower. You can curl the petals up a bit for a more dimensional look. You're done! --Now, just add your flower to a project! This is a fun, easy way to make your own custom flowers and perhaps use up some scraps! And while you are signing up for the newsletter, check out the challenges this month. The DT posts new challenges on the 15th of each month. So come on over and join in the fun! Hope you're having a great week so far. Thanks for stopping by!! Hi Everyone! Happy Monday!! It decided to rain on us today, which is so not fun. LOL!! We had a beautiful weekend and today...rain. At least it held out until Monday and didn't ruin our weekend fun. The Design Team at Crazy Daisy had the pleasure of using sketch #124 over at Sketch Inspirations. Check out this beauty! I finally tried some of those swirly flowers i've been seeing all over the place. They were fun to make!! I added some big pearls in the middle. I love finally get some photos from last summer scrapped! And it makes me so anxious for summer now...but no such luck today. Just rain for us. Pop on over to the Sketch Inspiration forum to see what the other DT members did. AND join us! 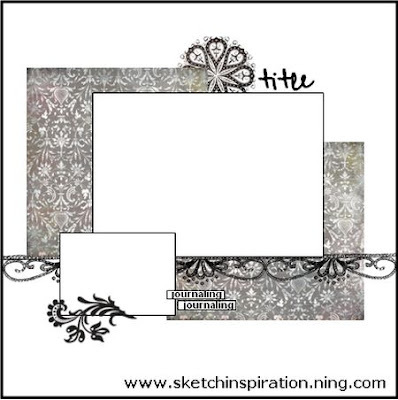 Make a layout with this sketch and you might win a May Mini Kit from Crazy Daisy. Pretty cool, huh?? The May kit from Crazy Daisy is a very eclectic mix of Pink Paislee, My Mind's Eye, GCD Studios, Prima and more!! I just loved the Pink Paislee paper in the kit, from the Bayberry Collection. Such great colors! This black and white paper was just begging to be cut out. And I just love the pop of lime green! For this layout, I used paper strips behind the photo to make it pop and then cut out my favorite butterfly on the Indie Art Cricut cartridge. On the previous layout and this one, I used some bubble wrap painted with acrylic paint to stamp directly on my layout. Such a fun technique! I also used paint to highlight the title. I had lots of fun with this kit! The colors are really unique and were quite fun to play around with. I hope you are having a great Friday! Any big plans for the weekend?? We have our school carnival tomorrow night and our last weekend of sports. I sure hope the weather is nice. If you ask my husband what kind of cookies he wants...it will go 1 of 2 ways. Either chocolate chip or snickerdoodle. If I did a statistical analysis on all his answers over the past 10 years, I think snickerdoodle might edge out chocolate chip. So...for his birthday I decided to make a Snickerdoodle Cake. And low and behold, I found a great recipe on the internet! Now i'm convinced you can find anything on the internet. 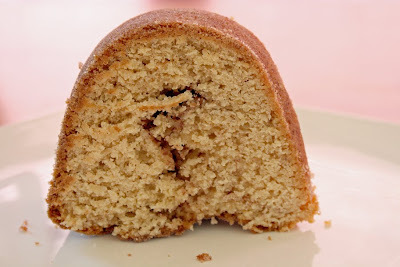 I found a recipe for Snickerdoodle Bundt Cake on the Dozen Flours blog. 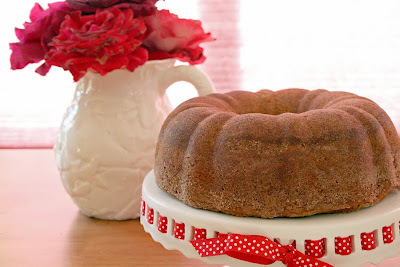 I was a little hesitant to make a bundt cake for a birthday cake, but then decided to just go for it. Yeah, i'm crazy like that. The key to this cake being super fabulous was after you grease the pan, you dust it with a cinnamon/sugar mix. And it created this wonderful sugary crust on the outside of the cake after you tip it out of the pan. Heaven!!! 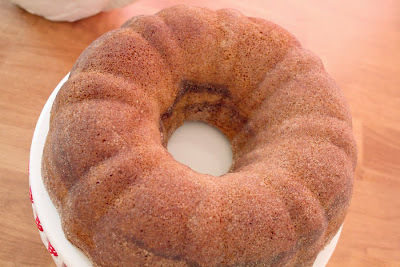 You layer 1/2 of the batter in the pan, sprinkle on the cinnamon/sugar mix, then layer the other 1/2 of the batter. 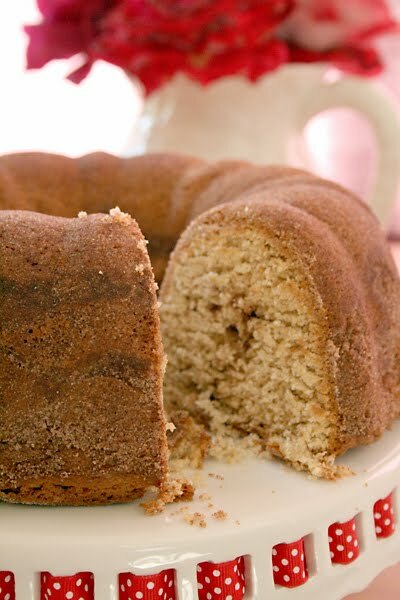 You end up with a layer of cinnamon-y goodness in the middle of the cake. This cake was amazing. It was moist and sweet on the inside with a crunchy sugary crust. JUST like a snickerdoodle cookie! My husband said it was the best cake he's ever eaten. We ate it with a big scoop of vanilla bean ice cream. Oh man, was it good! If you were feeling sassy, you could pass it off as a coffee cake and then be justified to actually eat cake for breakfast. I highly recommend this cake. It was wonderful. Yeah for recipes on the internet!!! Thanks for stopping by! Welcome to the week everybody! After a nice relaxing Mother's Day yesterday and a fun weekend, it was sure hard to get back into the swing of things today. I just have a short post today, I want to share a Mother's Day card I made for my MIL. We met up with my husband's family on Friday night to celebrate. Fun times! I finally tried out the scor-tape + glitter trick that I've seen on Nichole Heady's blog. I love how it looks. I thought the glitter would be a mess and wouldn't stick that well, but it stuck! I have so many projects i'm working on right now!! I can't wait to share them all with you, i've been a busy bee. Hope you had a great start to your week...thanks for stopping by! Happy Sunday and Happy Mother's Day to all the Mom's out there!! I have another recipe for Sweet Melissa Sunday...Orange Blueberry Muffins. I have to stop right there because I did not include the crumble on top. 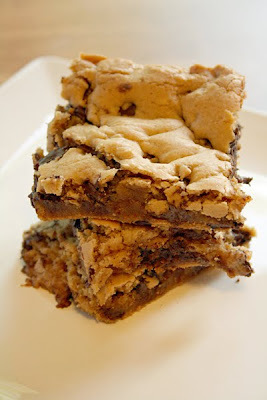 The night I baked these I ran out of brown sugar and had no pecans...so I couldn't make the crumble. 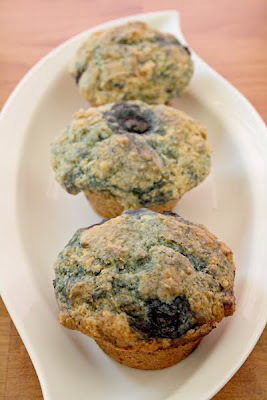 But the muffins were pretty good regardless! I substituted fresh blueberries for frozen. The lemon and orange zest in the recipe was fabulous, it really kicked the flavor up a notch. They were the best warm and fresh out of the oven! Doesn't this one look like an eyeball looking at you?? I was a bit disappointed that they were not as good the next day. They were pretty dry and crumbly. But to be honest, not too many of them lastest past the first day. 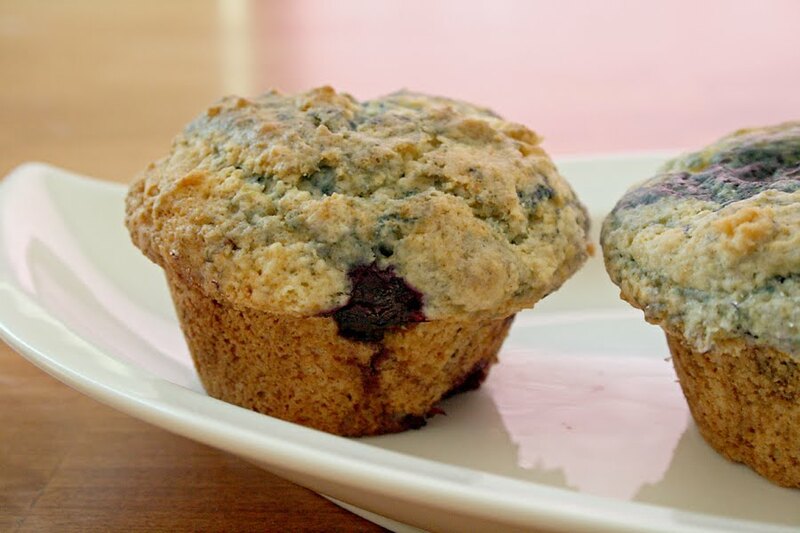 Muffins are a huge crowd pleaser in this house. 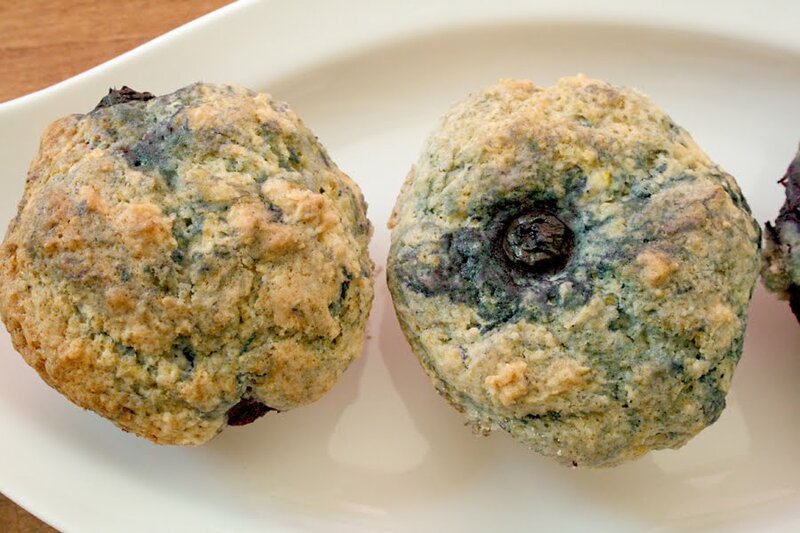 Thank you to Chaya from My Sweet and Savory for picking this recipe. 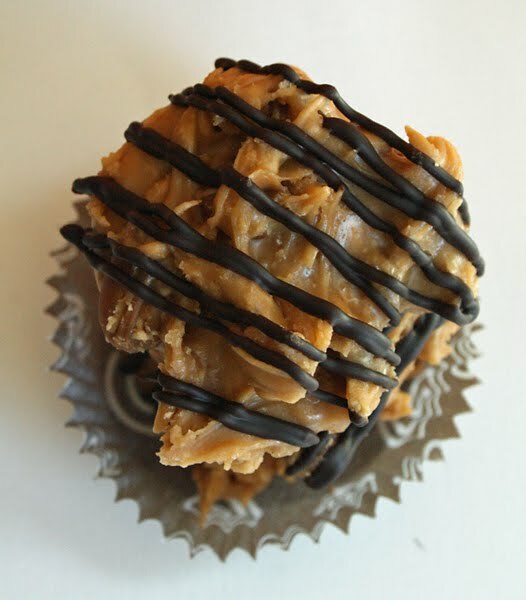 Please check out all the other SMS Bakers to see what they did with this recipe. I hope all you Mom's have a great Mother's Day today!! !